In the wake of Autumn half term, the glacier in Tignes has an eerie calm about it. With fewer teams training this week and more slopes now open, queuing in Tignes has never been quicker. Lower temperatures have helped preserve good snow conditions on pistes, and this morning I had the delight of finding some untouched ankle-deep powder beneath the Vanoise lift. Keen off-piste skiers will have to hold their horses, it’s just a bit too early for that. Though ski-touring enthusiasts were common place in the Grand Motte car park, I can’t justify this sort of ski-trashing excursion in the quest for a greater lung capacity! The pistes of Double-M and Carline still rely heavily on the work of the snow-cannons as they finish in Val Claret, and will hopefully benefit from the snow-showers forecast for Sunday and Monday when the freezing level should drop to 1400m altitude. 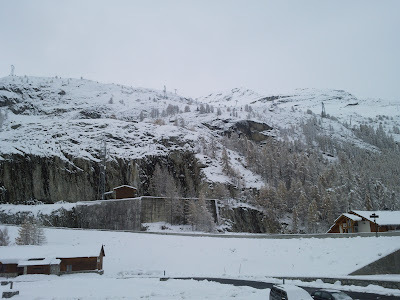 This optimistic outlook holds Tignes and Val d’Isere in good stead for the official opening of the Espace Killy on the 28th of November. This entry was posted in Snow Reports on November 19, 2009 by Rorie. Great news for pre-season beginners, there’s no more snowplough lessons at 3500m altitude! The Tignes Le Lac lift Rosset has been operational since the weekend, as has the Tichot lift in Val Claret and Leisse on the Glacier. Warmer weather has transformed the previously firm pistes to spring-like conditions, a little bit slow and sticky for my liking, though the higher altitude slopes were unaffected. 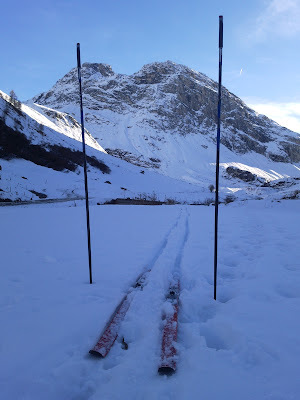 Venturing out on the cross-country skis again, I found myself breaking-trail in Val d’Isere’s Manchet. The heavy spring-snow was a real test for my novice technique, frequently tripping myself up as the toothpick skis dissapeared into the aged powder (In mid winter, this area is dedicated to Nordic skiers and the tracks are well maintained). I finished the day with several descents, a dozen good falls, and the conclusion that there’s not much I can hurt while on these skis, other than my pride. This entry was posted in Nordic Skiing on November 16, 2009 by Rorie. Great news for Autumn season skiers in Tignes: The Lanches chairlift opened yesterday and it’s now possible to ski down from the glacier back to Val Claret thanks to a week of much needed snowfall. Browsing through my recent blog posts, the snow report was all too familiar- Firm and icy conditions, fine for the racers but a bit too much for the tourists. Well, hopefully those days are long gone, or at least until next summer season. A week ago Ania and I enjoyed a lovely Sunday walk from Les Boisses, up into the Vallon de la Sache, traversed across to the Marais, followed a track down to the Glattier, before walking back to Les Boisses through the forest section of the mountain bike trail “Wunderboisses.” If we wanted to do the same today, we’d need snow-shoes. Here’s the view from my window taken this morning. At higher altitude, the weather interrupted regular activities on the glacier and the funicular was closed for three days this week due to high winds and heavy snowfall. Proving that good things come to those who wait, by Friday the weather had cleared and the snow was sensational. Check out my Youtube playlist of Friday’s training so see just how good it was. This entry was posted in Snow Reports on November 8, 2009 by Rorie.